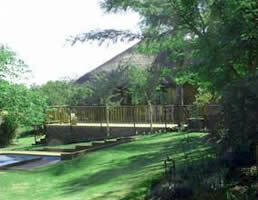 Langeni Lodge provides guest lodge accommodation in Northriding Randburg, Johannesburg. Langeni Lodge is conveniently situated for all major centres of Gauteng and the main tourist attractions, just a short distance from the N1 motorway and very close to The Dome and Northgate Shopping Centre. Set in 10 acres of gardens and grounds and being part of the North Riding Estates conservation area. The Guest Lodge is a short drive to Sandton City, Monte Casino, Randburg CBD. 40 minutes from Johannesburg and 15 minutes from Lanseria International Airports. The following treatments are available at Langeni Lodge: Aromatherapy, Swedish Massage, Sports Massage, Indian Head Massage, Reiki, Shiatsu, Balancing. Langeni Lodge has a conference facility for between 10 to 35 people and full catering can be provided. A small game park is presently being established adjacent to and part of Langeni Lodge. The park will be approximately 55 hectares and will feature dams, watering holes, hides and walking trails. Local attractions: At Northgate Shopping Centre you will find a Virgin Active Gym, an Ice Skating Rink and Cinemas. The Dome exhibition and concert centre is also on our doorstep and includes the superb Nightshift nightclub. Close by is Banbury Cross where you will find excellent restaurants, pubs, bars, takeaways etc. and this centre in particular attracts the younger generation. Langeni Lodge is situated on The Crocodile Ramble and The Cradle of Humankind is close by as well as The Lion Park and Rhino Park as well as many more well known tourist attractions too numerous to mention here.